One of the next-generation blues and rock guitarists, Sean Weaver is an avid player, as well as instructor at his home in Nashville, Tennessee. He brings his music, influenced by Jimi Hendrix, Eric Clapton, Stevie Ray Vaughn, and the three Kings: B.B., Albert and Freddie, for an evening of blues and classic rock guitar virtuosity. Joining Sean will be Jim Nichols on guitar, John Nichols on bass, and Dave Rokeach on drums. 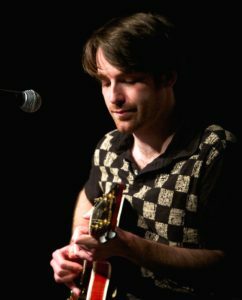 Although his earliest memories are of climbing up on a countertop to reach FM radio, since then Sean Weaver has traversed many musical pathways ranging from Chicago & Texas blues to an uncanny command of the major guitar figures of the 1960’s rock era, to the golden age of ‘50s Chet Atkins and 20th century country-blues minstrels, putting him on stages and festivals including the Chet Atkins Appreciation Society, National Summer Guitar Workshop, and historic Ryman Auditorium. The recipient of awards from both the Home of the Legends Thumbpickers Association and Jimi Hendrix Electric Guitar Competition, he has performed alongside Thom Bresh, Billy Cox of Jimi Hendrix’s Band of Gypsies, Vince Gill, Amy Grant, Les Paul, Richard Smith, and more.